The Islamic Fintech Dialogue (IFD) Conference is an event that focuses on the convergence of the Islamic finance industry with the financial technology (fintech) industry. The inaugural IFD2017 which was attended by more than 300 participants from across the globe including Canada, Japan, Singapore, Thailand, etc. became a trailblazer for dialogues on this convergence and IFD2019 promises more with enlightening sessions and captivating speakers. Call for Islamic Fintech Pitch Competition (Contact us for detail). Islamic financial industry in fintech/digital transformation – What are the understanding of these institutions toward new technology development. Regulatory – Do existing regulations encourage institutions to engage in Fintech? Shariah Compliance – What Shariah mechanisms are in place to ensure that the technology is Shariah compliant? Blockchain, machine learning, artificial intelligence, smart contracts, while merging them with Islamic concepts. How the initiatives contribute in solving issues in the Islamic finance industry. How the initiatives are encouraging and inspiring their staff and students towards engaging in Islamic Fintech. Raise awareness on rapid growth of Fintech as a dominant disruptive element in the financial industry. Explore how Islamic financial institutions (IFIs) can play a major role in the Fintech industry. 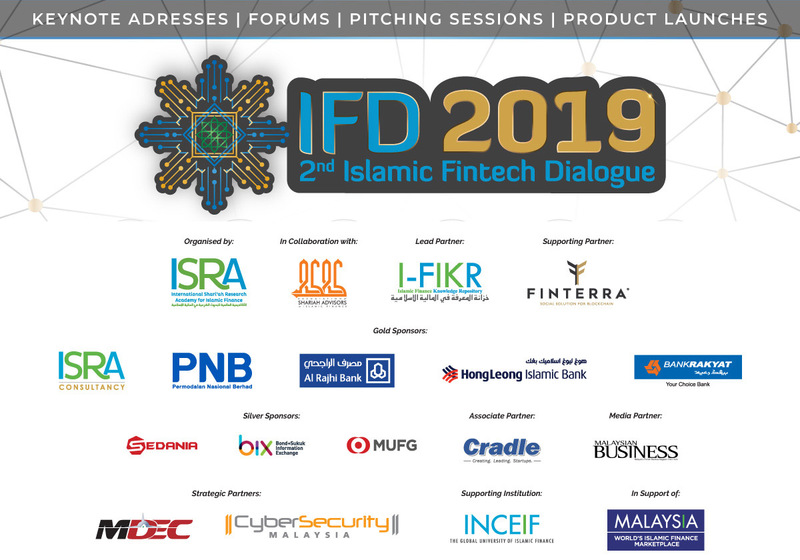 2nd IFD will include a line-up of influential amazing expert speakers on Shariah and Fintech as keynote speakers to shade light on broader perspective on the future integration of Shariah and Fintech. There will be very engaging and interactive panel session from industry experts. The event will have a showcase on some new and innovative fintech initiatives with along with as Islamic fintech pitch competition. Another major plus for this event is that I-FIKR Digest, which is a monthly digital magazine, the bumper issue will be printed and distributed to all the participants and the theme for the magazine for the bumper issue is “Islamic fintech”, which will feature articles from Islamic fintech experts. The International Shari'ah Research Academy for Islamic Finance (ISRA) was established by the Central Bank of Malaysia on 26 March 2008, as an initiative to promote applied research in the areas of Shari'ah and Islamic finance. ISRA also acts as a knowledge repository for matters related to Shari'ah and fatwas (resolutions) in the Islamic finance industry. ISRA provides a platform enabling the largest possible number of practitioners, Shari’ah scholars, regulators and academics to participate, both locally and internationally, in pioneering research, serious discussions and creative thinking in order to help Islamic finance realize the objectives for which it was originally established. More information about ISRA is available on its website at www.isra.my.